This card has nothing on the back except the number ‘17129’ in the top right corner. The engine is ‘Improved Precedent’ or ‘6ft 6in Jumbo’ or ‘Big Jumbo’ No. 619 Mabel and appears to be painted plain unlined black. In case is not obvious, the stock is Midland Railway, headed by a milk van. I am unable to detect whether the coaches bear LMS insignia, but I think it unlikely in 1923. The number 17129 is the Locomotive and General Railway Photographs reference number. 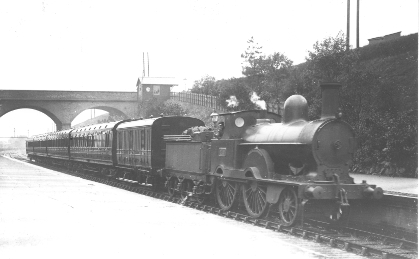 The picture is by Henry L Salmon and is taken at Pear Tree and Normanton station around 1923. The train is said to be a Derby to Walsall service. The stock looks to be in LMS colours. I‘m sure it is Peartree station but the train is going towards Derby, so a Walsall to Derby train?